Have a Group, want to pay separately? EASIER STILL! Want to see our food? PICTURE THIS! This time of year is a sensation. Ya might just find only frustration! Thanksgiving is on November 22 this year; we’ll be closed the next day, “Black Friday”, but we are open Saturday & Sunday, November 24 & 25, as usual. If we do not have your email address or if you have not received an email with the Deposit Bill for your reservation in it promptly after making it, please contact us as soon as possible, to avoid losing your space. To give us your email address, either text it to us or (much preferred) send it by email using the click at the bottom of this page. Be sure to read the Thanksgiving 2018 Flyer (“1-” below) which has prices, menu and other information. Thank you for your cooperation. 1- Make your reservations NOW! Click HERE for the Thanksgiving 2018 flyer PDF, which has FULL information. Remember that we assign tables in order, but only after getting that FULL information–your full name, preferred time (on any half or full hour), and an accurate count of both regular seats needed (includes boosters for kids) and also a count of any high chairs or wheel chair access needed. For example: “John Doe, 2 PM, 6+1 hc”. You’ll then get an emailed confirmation with a time and the deposit billing; may take a day or 2 but requests will be confirmed in the order full requests were received. If you only give a range of times with no preference, that will slow our helping you—please give us one PREFERRED time, along with an acceptable range of times if your preferred time is not available. You will still get a chance to accept any time we offer via the confirmation and deposit request we send out. When you make your deposit, that is your non-cancellable commitment of that deposit to at least that number, with increases only if space is available. 2- Click HERE for terms & conditions for your Advance Deposit Terms that will be requested by email. Yes, this doc may seem complex, but empty seats or mistakes on holidays, ouch, thanks for bearing with us in dealing with the last minute “what, me plan?” world we face. When you make your deposit, that is your non-cancellable commitment of that deposit to at least that number, with increases only if space is available. Repeated because it is important. Prices on our holidays are mostly all inclusive except for tip & tax. Certain desserts & beverages are extra. DEPOSITS will be required this year–see the link above. 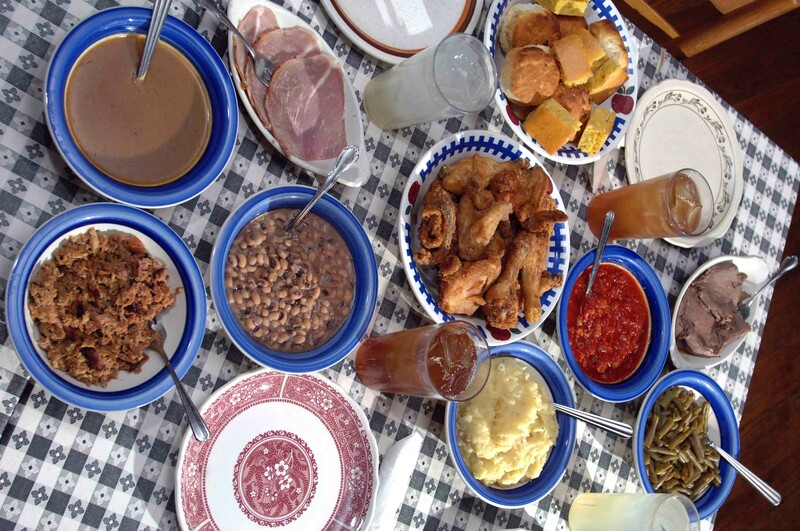 You get our famous FamilyStyle Turkey Dinner w/ Country Ham & great sides, Tea-coffee-lemonade & Dessert choices. (most refills n/c as always). See our Thanksgiving Flyer linked above for more information. We appreciate your viewing our FaceBook page but please use email, text or phone to reach us regarding reservations & other more time-sensitive matters. And phone or text only for “day of” matters–thank you! DID YOU KNOW–our main phone 556-3284 is a cell phone, so you may send us text messages on it. NOTE–that phone number now accepts TEXT messages! to reach us via email (remember to await our confirmation, especially on large groups, on calls as well as emails! ); Like us on Facebook for updates, too.